Boo Weekley remembers being sick twice before his drive. Lee Westwood's hands shook so much on his debut that he couldn't set up his tee. Sergio Garcia at Brookline was convinced he was going to miss the ball. Three-time major champion Padraig Harrington said he couldn't even see his. 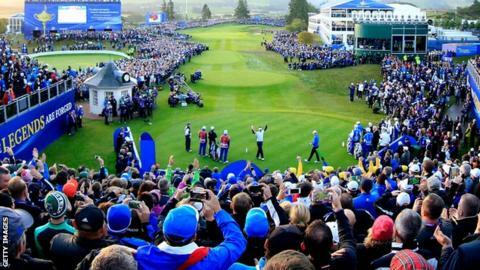 Welcome to the first tee on the first morning of the Ryder Cup, where strong men go weak and weak men drink strong. Like impatient children on Christmas morning, the dawn risers are forced to wait. Slowly the rest of the scene emerges from the gloom. A blue horseshoe of stands, autumn trees behind, a line of hospitality booze-barns moored along the fairway like cruise ships. When you hear the tales of what this small stage can do to big names, you conjure up a bear-pit of fear and loathing, a torrent of chants and songs and abuse. US captain Tom Watson had given his rookie pairing of Jordan Spieth and Patrick Reed a chill warning of what would await them. "I told them, 'I'm going to throw you in the ocean without a life preserver. You're on your own.'" "I was a nervous wreck," admits Peter Baker, the Englishman who made his debut in the USA's last victory on European soil, 21 years ago. "I live only 30 minutes away from the Belfry, so I knew the course inside out. But when I stood on the first tee and looked up I remember seeing a tree I'd never seen before. I thought, 'Who planted that tree overnight?'" Europe captain Paul McGinley had even wanted this year's players to feel like gladiators emerging into the coliseum, sending them out through a low tunnel that leads from Gleneagles' driving range to the first tee. The reality is somewhat more prosaic. While there is giddy excitement at the first sight of anyone in official garb, the mood is cheerful rather than fearful, polite rather than poisonous. Starter Ivor Robson is given a standing ovation, to which he responds by waving his furled umbrella to all corners like a centurion at Lord's. As ring-walks go, it is hardly Ricky Hatton in Las Vegas. If this is a bear-pit, it's one with a strict self-enforced dress-code where the bears shake hands and stay respectfully silent as their rival's claws go back. Neither is it actually all that noisy. There are barbed songs ("10-6, and you still don't win,") and a little light joshing (each of Webb Simpson's practice swings are followed by massed shouts of "FORE!" - he promptly duffs his opening drive just past the ladies' tee), plus the celebrity presence on the US bench of their biggest sporting icon of the last 30 years, Michael Jordan. But it is not the early morning beer garden that was Celtic Manor in Wales, when the songs were unrelenting, and it is not K Club in the Republic of Ireland, when recently bereaved Darren Clarke was roared onto the tee with the aural equivalent of a collective arm round the shoulder. Jordan is such a regular at this event that his intimidatory airness has long since dissipated. He owns more free Ryder Cup jackets than he does NBA championship rings. Bubba Watson exhorts the crowd to holler through his backswing, just as he did at Medinah two years ago. The carefully rehearsed chamber singers in the stand respond with a burst of 'Kaymer Chameleon' when the man who sunk the winning putt later that weekend steps up. Yet even when the gloves are off the players put them back on. Justin Rose emerges with a pair of mitts so robust they look like he has been interrupted removing a leg of lamb from the oven. Phil Mickelson sports the sort of thick black gauntlets that Toad of Toad Hall would pull on for a spin in his charabanc. The temporary stands here only hold 3,000. That is nothing compared to the 80,000 who roared Jessica Ennis to her blocks for her 100m hurdles heat at the London Olympics, or the 100,000 fans who pour abuse on opposition batsmen when they emerge on Boxing Day at the Melbourne Cricket Ground to perform similarly complex technical skills. It cannot compare with the intimidation experienced by an England fly-half lining up three points in a Six Nations decider at the Millennium Stadium, or the wall of noise that greets the Detroit Lions when they walk out at Green Bay. But this is the closest golf gets. For two years these men play in deferential silence and chaste applause. Like nuns in a nightclub they are then released into an alien environment where the normal rules go up in smoke. Even if you can ride out the merry bedlam, you then have to deal with the deathly hush that follows. "The silence levels on the first tee in Medinah shocked me," recalls Graeme McDowell, who has admitted he felt more nervous on the tee at Celtic Manor in 2010 than he did at the birth of his first child. "I remember putting the tee in the ground, the whole place going deathly silent and standing over the tee shot thinking to myself, 'This is just the most bizarre feeling I've ever had in my life'. And you have to remember how it used to be. When Watson made his Ryder Cup debut in 1977 there weren't even any grandstands. There was no need. The small number of spectators who bothered turning up could easily be contained by a simple gallery rope. "The electricity you get from the crowd is something which is the biggest adrenaline rush you could ever possibly have," says Ian Poulter, who was serenaded on Friday morning by "Walking in a Poulter Wonderland". "You don't need to control it. You've been waiting for it for a long time, so you just need to grab hold of it and let it go."